Figure 1: This patient complained of a sensitive tooth. The photograph shows receding gums and an exposed tooth root. 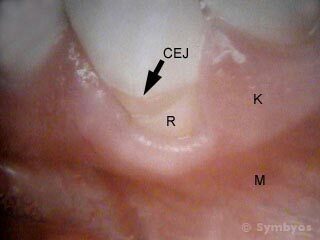 “CEJ” indicates the cementum-enamel junction, where the white glassy shell of enamel tapers off. Normally, attachment fibers would connect the gums (k) to the darker-colored cementum of the tooth root. The thin zone of gum tissue around the exposed root will not hold up to tooth brushing and food abrasion over time. M is the unattached mucosa, which is thin enough for the underlying blood vessels to show through. Gingival recession, more commonly called receding gums is a condition in which the attachment fibers holding the gums (gingiva) to the tooth and bone detach or are otherwise compromised, and the tooth root is exposed. The tooth may or may not be sensitive. Causes of receding gums may include periodontal disease (i.e. bacterial origin), long-term heavy bite stress, or simply unfavorable tooth position in the mouth. For years it has been thought that aggressive toothbrushing may cause receding gums. The current thinking, however, is in favor of bite stress. It is also possible that aggressive brushing and exposure of tooth roots to an acidic environment may aggravate receding gums that began another way. Before discussing options for treatment, it is important to consider why treatment may be recommended at all. The first reason is sensitivity. Exposed tooth roots may be sensitive, due to the exposed dentin. If this is the only reason treatment is being considered, your options may include use of sensitivity formula toothpaste, topical fluoride treatment, or application of desensitizing medications. If sensitivity disappears following these treatments, but then returns weeks or months later, the gingival recession may be progressing, and the underlying cause(s) should be identified and treated appropriately. 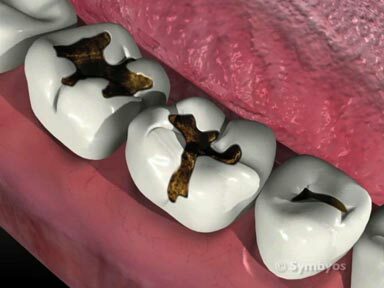 The second reason is that the root is less resistant to development of tooth decay (caries) than the enamel-covered crown. This is particularly true in patients who experience xerostomia (chronic dry mouth), due to the loss of their number one defense against decay—saliva. Saliva flushes and rinses away gross plaque, and helps to buffer acid levels in the mouth. Xerostomia is common in elderly patients, and in patients who take certain medications. If gumline cavities develop following gingival recession, fillings can be placed into the root. The third reason to consider treatment is that receding gums frequently lack an adequate width of keratinized tissue to resist tooth brushing and food abrasion over time. In such cases, the gums generally continue to recede. The underlying bone may also begin to recede, and the tooth can loosen over time. Are the gums actively receding? 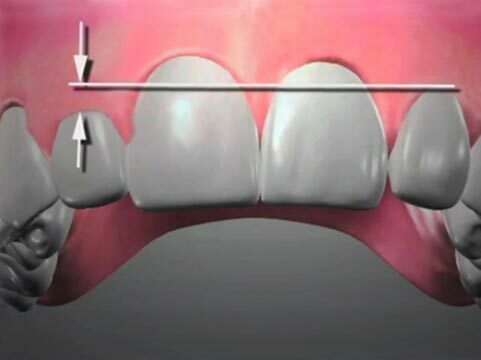 Treatment of receding gums should be recommended if it is found to be actively progressing. This can be determined by your dentist or periodontist, who can track movement of the free gingival margin with diagnostic photographs and periodontal measurements at successive checkups. If there is adequate tooth-supporting (alveolar) bone present, it may be possible to surgically cover the exposed tooth root and regain an adequate width of tough, keratinized gum tissue around the affected tooth. The procedure is called a sub-epithelial connective tissue graft, and is a surgical periodontal procedure. The likelihood of success of this procedure restoring the normal gingival contours is especially good if the V-shaped gum tissue between teeth (papillae) remain intact (Figure 1). How does the dentist diagnose Gingival Recession? Is the gum recession of bacterial origin (periodontal disease), or is it due to other causes like the position of, or forces on the tooth? Is the patient a chronic tooth clencher / grinder (bruxer)? Did the patient undergo orthodontic tooth movement that positioned their tooth in a place where the overlying bone was thin? Did the tooth naturally move into the mouth in an area of thin overlying gums and bone? Is the patient an aggressive tooth brusher? Combined with having thin or inflamed gum tissue, this habit may lead to gum recession. Does the patient have factitious habits which place abnormal stresses on the gingival attachment? Does (or did) the patient have a pierced tongue or lip? Barbells placed into the tongue and lip have been shown to produce gingival recession, most commonly on the lower front teeth. Determining the underlying cause of the patient’s gingival recession is important if treatment is to be successful. How is Gingival Recession treated? A procedure known as sub-epithelial connective tissue grafting was performed to cover the exposed root shown in Figure 1 under “Overview”, and to widen the zone of keratinized tissue (K). Because the condition was found to have occurred secondary to heavy bite forces on the tooth, the patient’s bite was also adjusted slightly. Treating the underlying cause(s) of the gingival recession as well as the condition itself helps to ensure long-term treatment success for the patient. 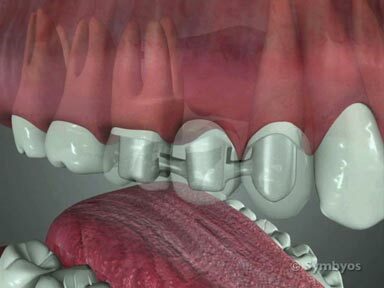 (Image courtesy John R. Dodge, DMD, MS, who performed the procedure). Treating only the sensitivity involved with gingival recession can be done with sensitivity formula toothpaste, or a dentist can apply desensitizing medication. Some Patients who are asymptomatic sometimes want to monitor the condition for progression, which can be done with diagnostic photographs and X-ray images (radiographs). Waiting for a diagnosed problem like gingival recession to get worse may not be a good idea, however. Gingival recession does not improve on its own, and treatment becomes less predictable as the condition worsens. Covering the exposed roots with gumline fillings can be done in some cases, and may be necessary if the roots become decayed. In appropriately selected patients, the procedure which can re-establish the most ideal periodontal health is grafting, a surgical periodontal procedure. Orthodontic treatment may be useful at repositioning teeth whose unfavorable location has contributed to gingival recession. Ironically, orthodontic positioning of teeth may also predispose them to gingival recession, if they are moved into an area of thin overlying bone. It is common for lower front teeth to require a gingival graft before they can be moved orthodontically. Sometimes teeth can be orthodontically repositioned (intruded) to help eliminate gingival recession.